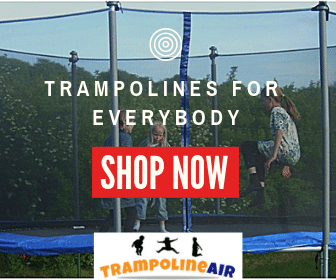 Choosing a trampoline for the little ones is no easy decision with many considerations to be thought through when deciding how to select the best trampoline with handlebar for your toddler. You will be able to find some great research and suggestions here that should assist you with knowing exactly what to look for. When conducting your search for the best toddler trampoline with handlebar, you will be introduced to a wide array of choice in design, size and construction materials. It will be very important to make your choice based on safety and durability instead of just eye appeal. 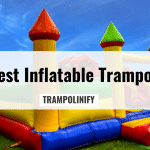 Here we will take a look at why these trampolines are considered the top choices and what other parents have to say about their experience in choosing the best trampolines with a handle bar. Most first time little jumpers will want the added security of the handlebar so they can gain self assurance and become familiar with the bouncing experience. Once this confidence is achieved, you will become the head cheering section for all of those new and exciting maneuvers that toddlers achieve with daily practice. Little jumpers greatly enjoy the sense of accomplishment and freedom as their little feet rise from the mat to meet with open air. 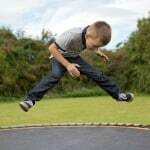 Trampoline play makes learning a fun experience for children while improving motor skill functions and meeting the daily recommendation for healthy exercise not to mention a great escape from tv and video games. Parents seeking the best mini trampoline with handlebar may be very impressed by this triangular, colorful jumper with the easy grip handlebar system much like that of a trike. Diggin Jump Smart will not only grab the immediate attention of your toddler, it can also serve as an interactive tutor during the exercise experience. 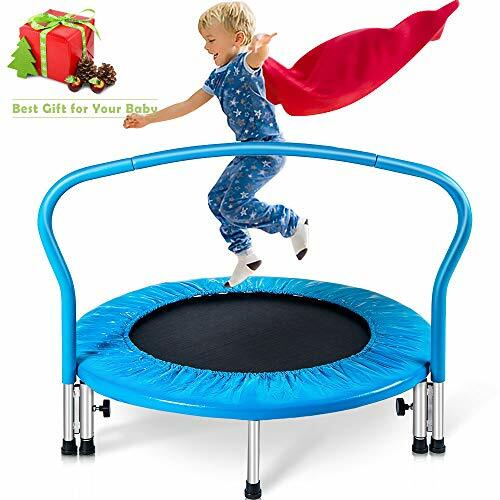 Parents have considered this choice as a best toddler exercise trampoline with handlebar mainly because the unique chassis provides a very stable landing for their acrobats. Children with motor skill deficiencies tend to favor the sound and bounce action along with the joy of pushing buttons and overall reviews would make me believe this model is a very popular favorite with them. One word of advice would be to review assembly instructions from experienced owners as getting this sturdy little jumper together appears to require some patience and know how. This model’s maximum weight limit is 80 pounds. The design features brightly color pads that kids will love. The pads are also easy to clean. 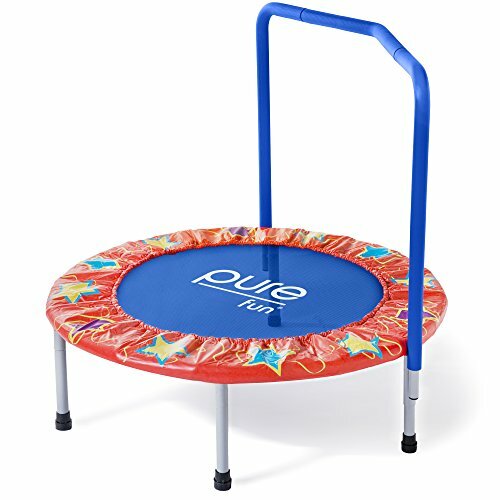 The split handle provides extra support for kids who are just learning how to bounce. The model’s triangular shape makes it incredibly easy to store. Plays fun and silly songs, including a count along and memory match song. Several appealing facts can be brought to the table for the Fold & Go which makes it a hot sales item and top of the line in popularity with parents. 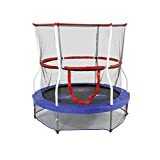 Aside being terrifically easy to assemble, this handy jumper can be packed up and taken along from toddler age to 150 pounds thus placing this model above and beyond a best toddler trampoline with handlebar. 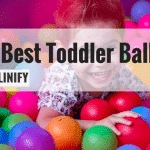 Your toddler will be able to enjoy great fun and exercise well into their elementary school days in most cases. Parents have suggested that even though assembly is designed with simplicity in mind, it often comes out better with two assemblers working together especially during the folding process. 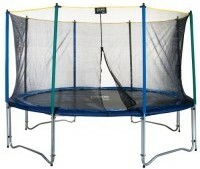 Parents also suggest attaching two 5 pound weights to the rear section of the trampoline for added stability. With this being mentioned as a safety concern for many parents, the aforementioned solution has been noted to work for children within the weight limit. Recommended for both in and outdoor play with supervision. Trampoline enthusiasts depend on the Skywalker brand bouncers as a reliable name for delivery of safety, quality and construction. 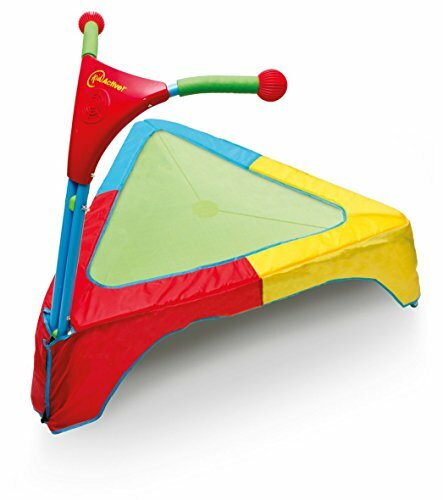 The 36” square bouncer mentioned in this review is suggested for young ones between the ages of three and six with a weight capacity of 60 pounds. Skywalker boasts a stout steel frame with robust legs that aid in adequate stability of this colorful number game bouncer. Strong elastic resistance bands unite the steel frame with the pad where they are interwoven and neatly tucked under a protective covering as an additional safety measure. Many of the benefits noted with this model are motor skill development assistance with enhanced number and color recognition while encouraging a healthy interaction of both fun and exercise. 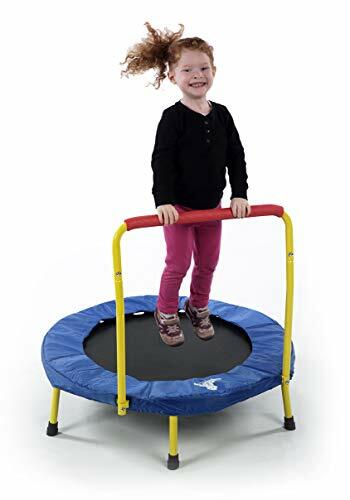 One of the absolute primary reasons we consider getting a trampoline for our toddler is to provide a healthy source for vital aerobic exercise. 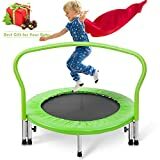 This little ladybug invites our first time jumpers to join in on safe and active fun with a bouncer that some parents have considered as a best exercise trampoline with handlebar where their children are concerned. Parents indicate in their reviews that they have absolutely no problems with getting their toddlers to exercise on Pure Funs appropriately colored ladybug with her smiley detachable pillow face. Safety and durability are communicated through the protective padding which overlays both the springs and child safe handlebar setup. Parents report that they have accomplished assembly in often less than one hour and that the children are attracted to the detachable pillow face. The Bazoongi Bouncer is a parent’s top choice item for the best trampoline with handle bar and offered by the manufacturer with an easy to grab, modifiable handle bar. The stability and construction of this six leg bouncing blast are a careful consideration in the design. Adequate, safe jumping space is one of the many featured assets and protection from any hazardous or sharp materials is a definite plus. Some parents mention in reviews that the assembly is slightly difficult and the springs may be tough for just one person to put together. 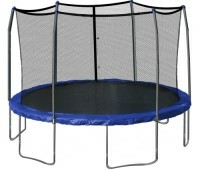 A few parents indicated that they feel the jumper is more for small toddler that are not overly active. Of course this colorful bouncer has the children’s vote and if you are making a gift purchase keep in mind that the package contents are viewable when shipped. 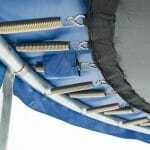 When researching the best exercise trampoline with handlebar, an excellent consideration would be the Merax 3 foot model which stands out for many reasons. Mentionable considerations would be the quantity of legs for stabilization, quality of mat material for durability and weight limitations for extended usability just to point out a few. Additionally the Merax is designed as a foldable space saving unit with a total weight capacity of 220 pounds. Easy assembly, affordable pricing, durability and ease of indoor or outdoor use with a rust resistant frame. The Merax 3 foot appears to provide a great way for our children of most size ranges to get good healthy exercise. The Little Tykes three foot jumper is much like the other best mini trampolines with handlebar in safety and durability. There are however some slight differences that should be noted when making a buying choice for the children. 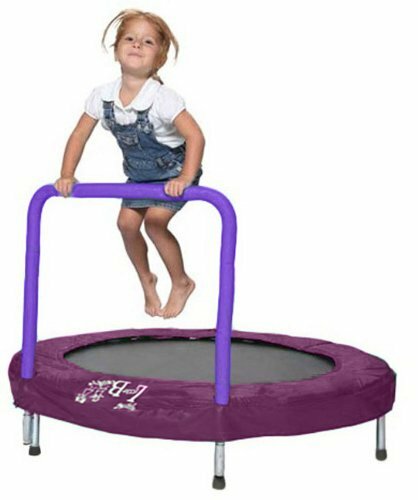 Certain construction differences make the Little Tike suitable for indoor use only and this should be kept in mind when researching to purchase the best toddler trampoline with handlebar. 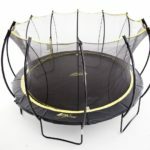 The springs are securely covered to protect your little one from harm, the jump mat is round and the frame on this model is made of both plastic and steel as opposed to other competitors in this grouping. Little Tike also kept children’s safety and fitness in mind when designing their exercise trampoline with handlebar for the three to six year old age group. 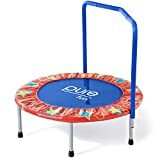 Also differing from competitors the handle bar on the Little Tike series is well padded and positioned across the middle of the trampoline perhaps to provide greater assurance of stability. Parents have praised Little Tike for easy assembly, great exercise fun and excellent indoor fun. Some parents have noted issues with their children biting on the foam handle bar and the back lifting from the floor during exercise. Other jumpers have suggested weighting the back legs on some of the other models. 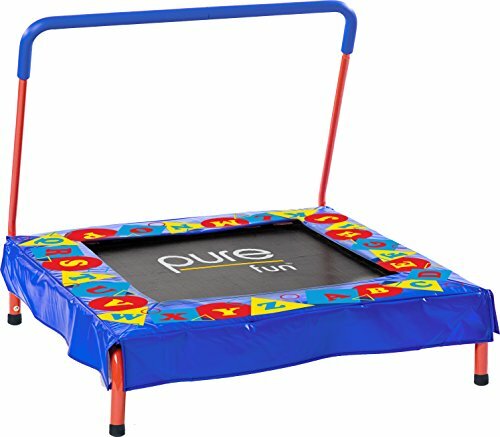 Here is another great addition to the best exercise trampolines with handle bar from Pure Fun. 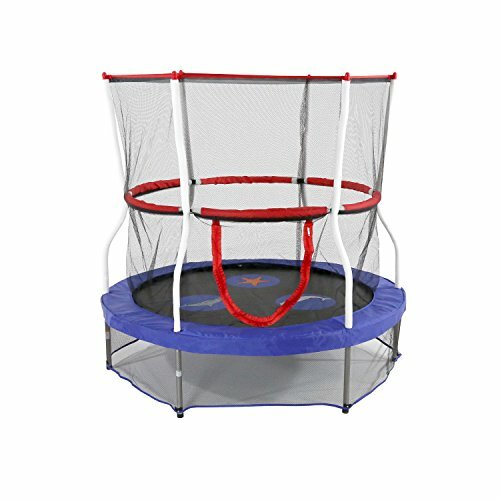 Parents have noted that their preschool jumpers get “big air” with an abundance of strong safety springs that come with this smart looking tramp. Reviews also list positive progress with alphabet recognition by their preschoolers which, may be attributed to the colorful letters adorning the frame pad covering. 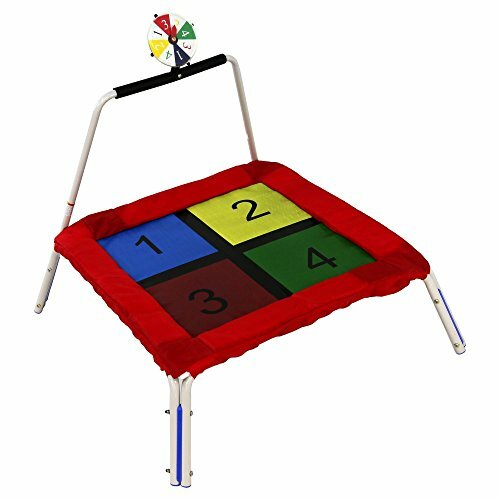 The weight capacity is about 75 pounds on this 36” square jumper and as always it may be a good idea to weight the back two of the four legs to insure added stability while your little one is jumping. The best recommendation here is for indoor use although the frame is steel, sturdy and comes with a long warranty. Parents differ in assembly opinions, with many feeling that assembly is not difficult. 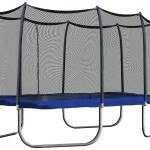 Skywalker offers young jumpers a bright attractive bouncer here that is perfect for indoor play and the security of an enclosure with a padded handlebar completely around the inside of the safety net. The jump surface is fully safeguarded from all metal parts and the grab handle is padded as well. Parents have provided some outstanding reviews about the Skywalker unit along with offering valuable insight into the fun their young ones experience bouncing safely inside the zippered enclosure. Some parents have mentioned that they have added pool noodles to the bars and poles for added color and durability. 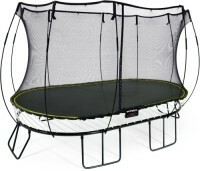 This sounds like a great idea for reinforcement and to enhance the longevity of this cute and sturdy trampoline. Lower enclosure attaches to the padded stretch band cover preventing little ones or small objects from entering underneath the jumping area. For our tiniest of little jumpers the best exercise trampoline with handlebar is the Diggin HopHop recommended for toddlers as small as 12 months. This hopper is just the right size at 23 inches of padded heart shaped bounce mat fun that can keep toddlers busy for long periods of time. The mat is specially designed for safety being low to the ground, padded, completely covered with a special stretch mesh fabric and brilliantly colored. The parent reviews seemed to be very mixed on this unit possibly having a lot to do with the size of toddler using the jumper. It is designed and suggested for 44 pounds and under. Some parents mentioned they felt the weight limit should be lowered while others claimed their very small toddlers do just fine with it. 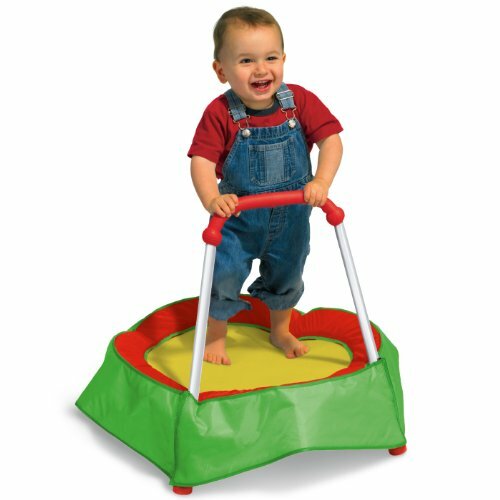 Many parents claim the little jumpers are pleased with their bounce fun. 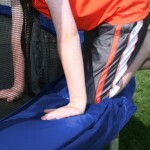 The importance of safety is the biggest concern when planning children’s activity with any trampoline with handlebar. 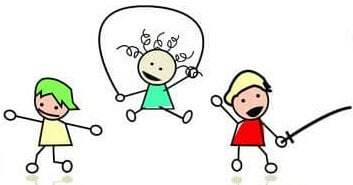 Keep in mind that every activity can be dangerous for little ones if they are left unattended and rules or recommendations are not taken seriously as the manufacturer has suggested. There is usually some sound advice offered from parents who have experience with little jumpers and are able to provide an objective review. Many parents have excellent tips and tricks to remedy issues that they have come across to insure the safety and longevity of your new purchase. 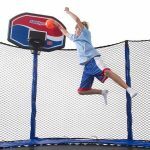 With a well put together plan and some good advice your little bouncer will have a healthy and fun method of exercise on one of these best trampolines with handlebar during their formative years.